OrangStand (Palmus Walkum) is one of Lanky Kong's special abilities in Donkey Kong 64, learned by purchasing a potion at Cranky Kong's lab at Angry Aztec for three Banana Bunch Coins. 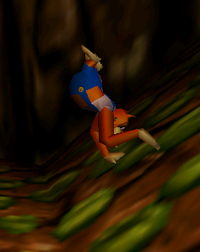 By pressing and holding the button while tapping the button, Lanky will perform a handstand and walk on his hands, enabling him to scale steep slopes he could not otherwise. Some slopes however, are too steep to climb even with the OrangStand. An enhancement of this ability, OrangStand Sprint, is later learned by Lanky in Crystal Caves, which allows a faster running speed, but requires Lanky to locate a barrel with his face on it. This page was last edited on January 2, 2019, at 00:48.